You won’t go away hungry! Of course, blueberry treats are featured, but we offer a variety of other food to keep you fueled as well. With several meal events, a dessert buffet, two food courts, and many street vendors, there’s something for everyone to enjoy. You’ll find crab rolls, lobster rolls, hamburgers, blueberry ice cream, and more. Here are the highlights: *CSCC means Centre Street Congregational Church. 4:30 – 6:30 p.m. or until the fish runs out! Under the tent at CSCC, $14 adults, $7 children 12 and under. 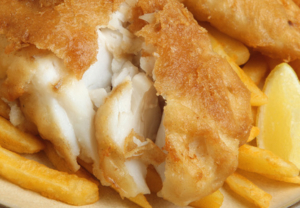 Haddock straight out of the cold Atlantic ocean, breaded with a corn meal mixture and fried to perfection, French fries, and coleslaw round out this “all you can eat” extravaganza! For those of you who “don’t like” fish…chicken fingers will be available. Finish your meal with homemade blueberry gingerbread topped with Gifford’s blueberry ice cream. 6:30-10:30 a.m. or until the pancakes run out. At CSCC, serving both inside and outside under the tent, $10 adults, $5 children 12 and under. Another “all you can eat” meal. 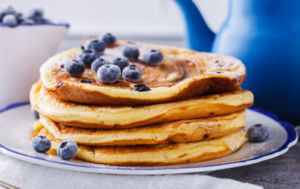 Menu includes blueberry pancakes as well as plain pancakes, Walt Getchell’s famous blueberry pancake syrup, made from berries harvested on Pumpkin Ridge in Marshfield, sausage, orange juice, coffee, tea, and milk. 11:00 a.m. – 2:00 p.m. Sat. and Sunday in the Church Vestry. Centre Street Church has bragging rights to some incredible cooks. This dessert buffet is the place to taste their wares. 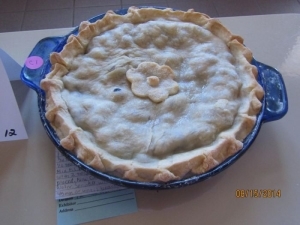 Every manner of blueberry dessert yumminess can be found here: blueberry cheesecake, blueberry pie, blueberry crisp…the list goes on and on. There are also treats for that rare person who does not love everything blueberry. 11:00 a.m. – 2:00 p.m., Saturday and 11:00 a.m. – 1:00 p.m. Sunday, under the big white tent next to CSCC. This year, the Washington County Children’s Chorus will be found selling their famous lobster rolls under the tent! They are also adding crab rolls to their offerings. I have also heard a rumor that there will be fresh oysters this year! The grill will be fired up serving hamburgers and blueberry sausage (an amazing taste sensation served with sautéed onions and peppers). The Towne Fryer will be there selling his amazing French Fries and donuts. Being hungry is not an option! Machias Bay Area Chamber of Commerce Food Court, Colonial Way Parking lot on corner of Free Street. Machias Eastern Star food items in Masonic Hall; baked bean supper in Masonic Hall 4:30 p.m.